Mmm, poor water quality, and/or nutrition, "stress"... secondarily (after the fact) the protozoan Hexamita/Octomita perhaps. Rarely does electrical current have anything to do with it. You might remember I started dosing with Cupramine about a week ago and have successfully put Ich in control. I also added some Seachem Reef Buffer as my pH was around 8.0. Therefore I think the pH is accurate however I have noticed small hole like structures on the upper head of both my Majestic and Blueface Angels. Both have been in the same tank for over a year. My conclusion is that it is unlikely to be a parasitic as the tank has high copper. More likely a water quality induced condition. and I am now giving him angel formula on top of everything else I am feeding him every other day. Any suggestions? Marc (Weiss); would you allow me to post your comments below on WetWebMedia.com? Would be helpful to many folks. I am writing this to several aquarium - keeping organizations and individuals who would have interest in the subject. Over the years, myself and many other aquarists have associated the use of granular activated carbon (GAC) in their aquarium filter with the appearance of 'head and lateral line erosion' (HLLE) in aquarium fishes. It appears to me that there remains a significant number of people that are unaware of this. Two recent studies have come to light that validate that the use of both coal and coconut based carbons can cause HLLE in marine fishes. Both papers make reference to freshwater fishes, though the studies were clearly done with marine species. The authors indicate that the same situation can occur in freshwater but did not do a formal study. I assure you that GAC kept in an aquarium filter recirculating water through it, will cause HLLE. The late Dr. George Barlow had also noted the correlation in his cichlid lab and held it as causation when I spoke to him. I regret the written reference is not at hand. I do remember he published this in an article on another subject. There is no proof that Hexamita is a cause of HLLE. Discus with 'Hexamita' don't usually exhibit HLLE. I've induced HLLE in flagellate - free fish by using copper, formalin, and even Metronidazole. Dr. John Gratzek was the first determine that there is no causation of HLLE as a result of Hexamita and put it in print. More recent fish disease texts, such as Noga's 'Fish Disease Diagnosis and Treatment', indicate the same. There may be other causes and/or combinations of them, that can cause HLLE without carbon filtration being used. 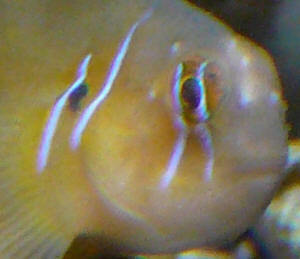 For example, I've noted that discus kept in CO2 enriched planted aquariums show pore enlargement. There's much more to be investigated and written on the subject. I wanted to get this out as soon as I could without any more elaboration. Sure, I want to get the word out to the newbies. I'm going to expand upon it once I find my forty year old files on the subject. The GAC guys have hated me for that long already! Just please send me a link where I can find it on your site. I'll put you on my list to receive further info on the subject as I generate it. Dear crew, your site has been most helpful for my success with saltwater tanks. I have spent days reading information on here, and I wanted to extend my deepest appreciation for all that you do. I am hoping this email will be quick and easy to answer. I am looking for some clarification on yellow tangs. I have had my tang now for 2 years in my 75g, w/38g sump. calcium ~420-450, PH ranges from 8.25 during the day to 7.95 at night (I have a probe which constantly monitors this). Temperature ranges from 78.1-78.5. Water flow is powered by 1 Mag 9.5, Mag 7 (soon to be replaced by another 9.5), and a Kor 3. Return into my tank is via 2 3/4" sea swirls. I drilled my own tank with Anthony Calfo's (not sure on spelling) design, with 2 1.5" bulkheads on the back/top of the tank surrounded by an overflow also only covering the back/top. Lighting is provided by 2 150w LED fixtures. Skimmer is a AquaC EV-180. I keep a fine DSB in the sump, with Chaeto over it, reverse daylight. I have a ReefKeeper Lite controller managing it all. I have 1 frogspawn, and 1 torch. I hope this wasn't too much info, but in past correspondence, information I thought was irrelevant turned out to be needed, so I wanted to ensure all was included. After reading through Yellow Tang diseases, I believe my tang is suffering from Malnutrition, but I wanted to confirm with your group. I have attached a photo below. I feed my tank a mixture of Ocean Nutrition Formula One, Formula Two, and Prime Reef Flakes 2-3 times per day, and feed a variety of frozen food every 3-4 days. The tang actively pursues everything I drop in the tank, including the meaty foods, and he is constantly picking at the rocks and glass for anything growing off it. I have tried dried seaweed in the past, but he never shows any interest. If this is malnutrition, is there another type of dry food I can try? I understand tangs, being herbivores, like to "graze" throughout the day, and I was considering increasing the frequency (not amount) of food per day. I work from home, so if this is recommended, it is not a problem. In case the picture doesn't come through, it looks like a loss of pigment around its eyes and gills. There are white patches in those areas. That have slowly been increasing in size over the last month. I thought it might be stress, as I recently moved everything into this 75g, from a "reef ready" 90g (I wanted a more efficient flow, hence the reason for my custom work). The tang does not appear to be acting out of the norm. And the only aggression in the tank has been Strawberry goby -> damsel, and clowns -> damsel. Mr Fenner, thank you for the very quick response. I did forget to mention I run carbon through a reactor as well, which I change every 4 weeks. I do a 5% water change weekly when I do my tests. I dose trace elements and Kalk, but I only started this in the last couple of weeks. Your question on the Nitrates/Phosphates, I am not sure what you mean by how I achieve this. I ensure there is no uneaten food left during feeding, I siphon the gravel in the DT when I do the water changes. I leave my DSB alone in the sump. I clean the skimmer 2-3 times per week. I have not been able to get above a 0 on my water tests in over a year. The fish and corals are growing fine, so I think I feed enough. The only thing I can think is that the Nitrates and Phosphates that do exist in my water are consumed so quickly I never get any readings? I do have 135 lbs of live rock in my system. I'll add the below mentioned foods and dosing to my routine, just need to locate some. Thank you for the suggestions. You mentioned exposure to carbon, should I stop the carbon reactor for a while and see if this helps? I just took a multimeter to my aquarium, and was unable to detect anything. The only non-grounded electrical components in my aquarium are the Kor 3 and the pump for my carbon. but I can't seem to get them healed. They are from the Christmas Islands. I have seen them spawn but have not been able to verify the eggs are fertilized yet. 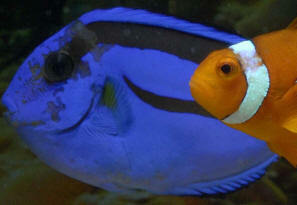 Both fish display normal behavior and eating, no wasting away or muscle loss. 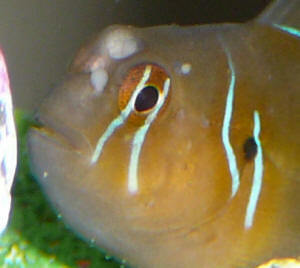 They have holes or erosion around their eyes, typical lateralis degeneration. Recently these areas have turned black. Since there isn't a definitive cause of this I've tried a number of things. First some system stats. made up of 9-11 tanks and a 75 gallon sump. This pair of fish sometimes visit the 60 tall (home of 2 clowns) if I think that is a better home for them. I moved them to the display tank after reading the most recent about the possible correlation of carbon dust and HLLE. Once or twice daily. Majority of their food is a homemade frozen food (marine fish meat, shrimp, crustacean meat, Nori, red algaes, spirulina, Selcon, garlic, vitamins, fish eggs, Nutramar ova). Also sometimes New Life Spectrum pellets but just a few feedings per week. Nutritional improvement. I think their daily diet (above) is both high in vitamins and HUFAs, balanced meat and veggies. This has been their diet for over 20 months. Water parameters. Always a battle of course but 30% water changes are done every 3 weeks. Nitrates always under 1ppm. I struggle to get them below 0.25ppm. Stray voltage. Tested with a multimeter. The Breeding system has a ground probe (and GFI) mostly for my health. Removal of activated carbon in the DT. Then I did a 100% water change (temp and pH adjusted). Carbon is necessary in the breeding system b/c of ozone. Protozoan treatment (Metronidazole + Quinine Sulfate treatment for 10 days in QT system). Lesions improved in appearance but returned to worsening within 2 weeks out of QT. No copper exposure under my care. I'm at a bit of a loss as to what to do next other than rehome this pair. Could it be that the decrease of HLLE with the increase of nutritional diet supplements were just really combating the effects of the carbon? Anyway, I just wanted to share, and get the experts (Bob's) opinion. Sorry, this should have gone with the original email, as the article only indicated the research, however below is an excerpt from the author who performed the research, indicating very compelling data / outcome. This was posted today. Quote: "I just finished the rough draft of my HLLE research on Monday and it has been reviewed internally. It is surely going to "pass muster" in regards to external peer review because the results were trenchant. Thanks for your response. With this research / conclusion in mind, do you believe there will be new protocol employed now with the use of carbon in aquaria? <Mmm, no; not really. I would like to point out that there are many recorded/documented "cases" of HLLE where the systems involved didn't use carbon of any sort. There are quite a few etiologies ascribed to this erosive condition/Neuromast destruction... Uhh, "the jury's still out". Should one consider not using carbon in their marine systems, or limit the use? For many folks the use of carbon is constant, and maybe a different approach should be taken here. This is of course, unless it is almost always reversible by removing the carbon at first sign, but at that point why use to begin with if this is a possibility? Reading CORAL magazine most recent issue I came across info on a study to be conducted to explore the link between carbon use and lateral line disease in marine fishes. If one would wish to prove out this theory for themselves, would poly-filter provide a safe non-carbon alternative to for use in filter compartment of reef sump? Also any thoughts on this subject would be appreciated. HLLE Related To Stray Voltage? Hello crew and thanks for all the great advice. The question has been asked before regarding the value of a ground probe. clear up the controversy or is this still just a myth? No myth, has been cited several times/places and your experience does not surprise me.